Our business and management students are discovering the difference a UMUC business degree can make. As a student pursuing an online business and management degree at University of Maryland University College, you can benefit from our career-focused curriculum, faculty scholar-practitioners, and comprehensive student support services. Find out how our students and alumni have applied the skills and knowledge they've gained from their business and management programs directly to the workforce. I've worked in several small businesses, but my ultimate goal was to work at a larger organization within a human resources department—something I wouldn't have been able to do without a degree. Just before I graduated, I was able to land that dream job at a prestigious community hospital. My classes helped me to master the language of finance and speak authoritatively in front of the institution’s business leadership. So much of the human resources program…ties into real life on a daily basis. That’s part of the reason I like the field; it’s applicable. In my capstone course, there was a big focus on Centers for Excellence. As I came to [Anne Arundel Health System], we were putting it into play. It was really cool to tie the concepts I was learning in the course to real-world applications. I was witnessing something I had read in a book, and my organization was doing this. When Deborah Bearor took on a project coordinator position, she impressed her colleagues with her relevant knowledge of the industry. 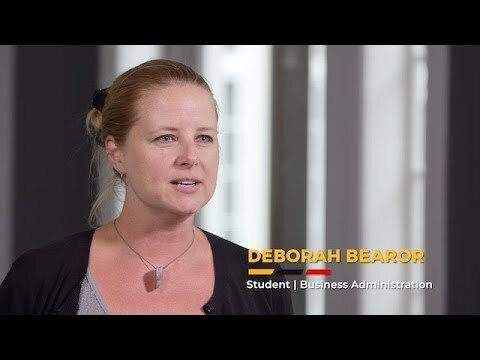 The understanding that Deborah brought from her strategic management course at UMUC added value to the conversation and made her an indispensable member of her new team. Ed and Natalie met in undergraduate school and started their family soon after. With full time jobs and two children, going to graduate school was a totally different experience. What motivated them? Knowing that what they could learn at UMUC would boost their careers. Meet students with similar interests, gain leadership skills, keep up-to-date with industry trends, and network by joining one of UMUC's business clubs and organizations. Meet business and management faculty members, who bring real-world experience and a career-relevant curriculum to the classroom.